On Tuesday, we’re a little sluggish and slow to get going. I go through the book, write a bunch of events down, ready our backpacks with water and supplies and eventually, we’re off. This is my lunchtime list. It’s just a small portion of the events available at that time. Just the one’s that most appeal to me. Lavender Mead – I can’t stand the smell or colour of lavender, but love the taste of lavender mead. Go figure! Metheglin Mead – mixed with spices: cloves, cinnamon, nutmeg. Reminded me of mulled wine/cider. Cabernet Mead – our absolute favourite. The Cabernet grapes appealed to our wine tastes. 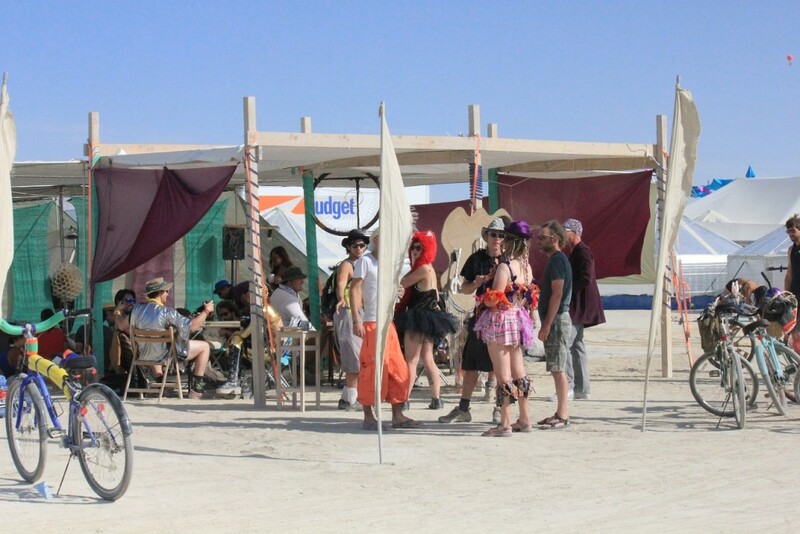 The best part of the event was staying around afterwards, drinking the meads and mixing with the other people. There was a good smattering of all age groups and outlooks. The event was put on by the BuzzInn, in Silicon Village, which was hosting a bunch of events about bees. A lot of the time, your location and the event times clash, so there is just no way you can make it from one side of the city to the other in time. We decided to head over to the Colorado Beer Tasting at the Embassy camp. There was a long line of people waiting, but it went quick, and we met a group of people about our age who were old time burners – like since the very early days. One of the men was part of a small placed camp, called Pendant because they made pendants for gifting. 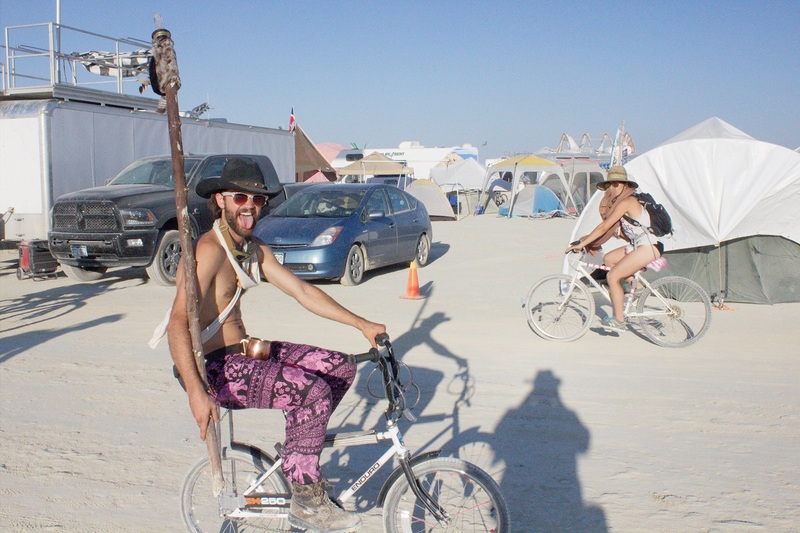 He gave Harold and I each a very pretty stone he had cut, polished and engraved with “Burning Man 2015”. He also invited us to their Brazilian Carnival on Wednesday afternoon. We rode back to camp for a late lunch. We’re finding that we never want to spend time making much, and our appetites are diminished. Today I found out how amazingly wonderful dill pickles and electrolyte drinks are. I was feeling tired and a little down when we got back, but after sitting down with a jar of dill pickles and a grape Zipp-fizz, I was instantly renewed. The B12 in the Zipp Fizz is particularly good for me, since I don’t get as much as I should, as a vegetarian. I think I might keep drinking these in the default world. We spent the rest of the afternoon in the monkey hut at the front of our camp. 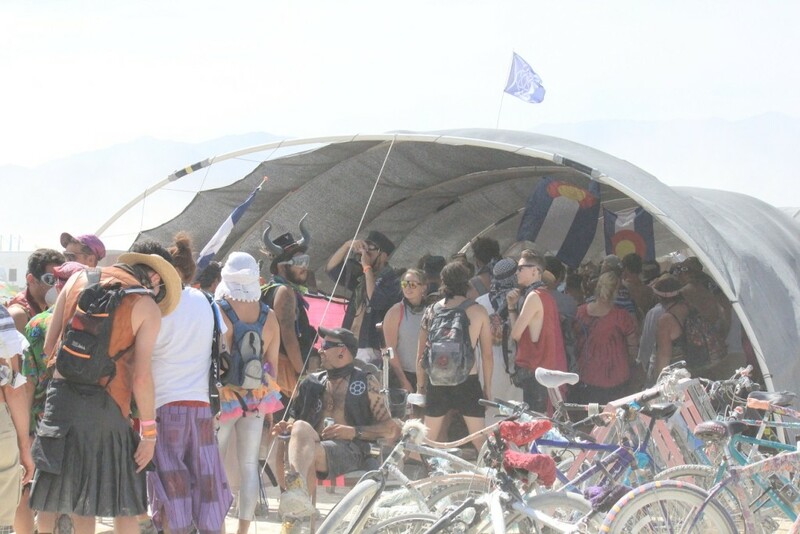 This is the common area where we all hang out and meet up. 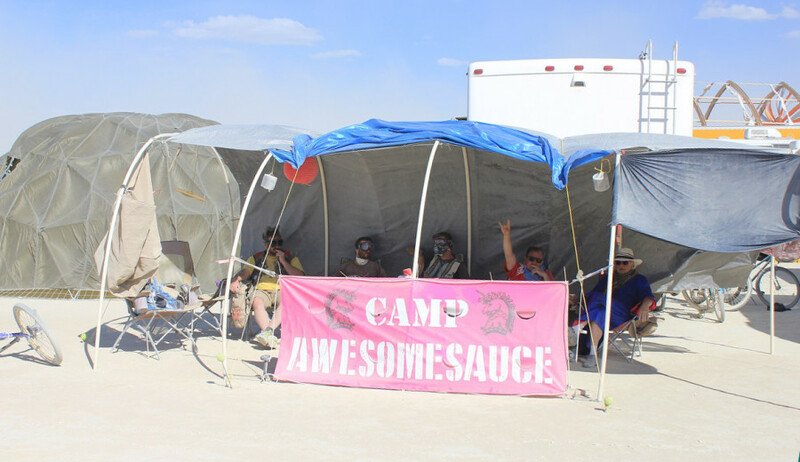 With a name like Camp Awesomesauce, you get a lot of people riding by asking what kinda sauce we have. Like most people who will come by this week, I was hesitant about trying our ‘sauce’. It’s a shot of bourbon, followed by a Siracha-Pickle juice concoction. It sounds questionable, but it’s a perfect complement to the dry, alkaline conditions out here. It was fun to see the expressions change from before to after people had their shots. Honestly, it is truly awesome! 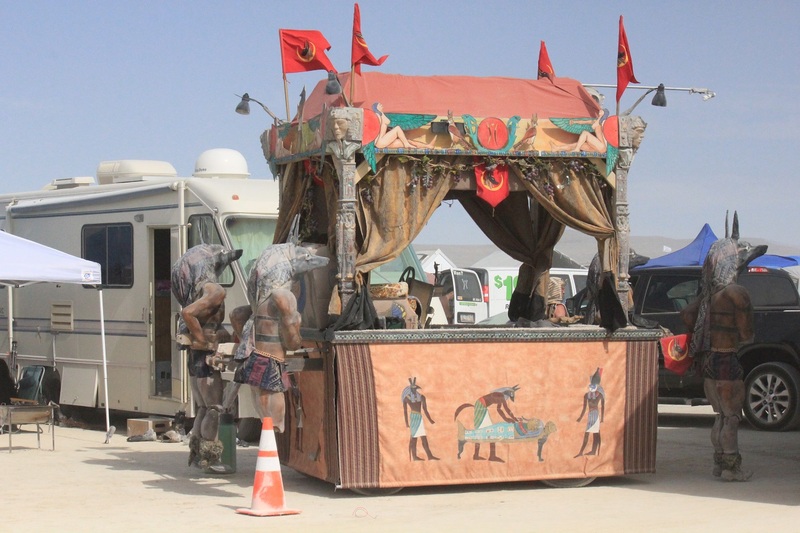 The monkey hut is made of pvc pipes and connectors that are bent over, tied down and placed over long lengths of rebar that have been pounded way down into the ground. Lengths of shade cloths are then tied over it. The cost of the pvc and rebar is about $25. The shade cloth can be anything, scarves, fabric, tarps or more expensive shade cloths. We had a mish mash of many types. Rebar is mandatory out here. You can’t stake a tent or shade structure with the little pegs you get from the store. You need long lengths of rebar you can pound far down into the playa so the wind doesn’t rip them out. It’s just as important to cover the tops of the rebar so people don’t gouge their bodies tripping over them. Most people use old tennis balls for the ends. We bought some rebar caps at Home Depot when we bought the rebar. In the middle of the camp, off to the side of the monkey hut, there is a dome. It took until Tuesday afternoon for people to get around to getting it up. 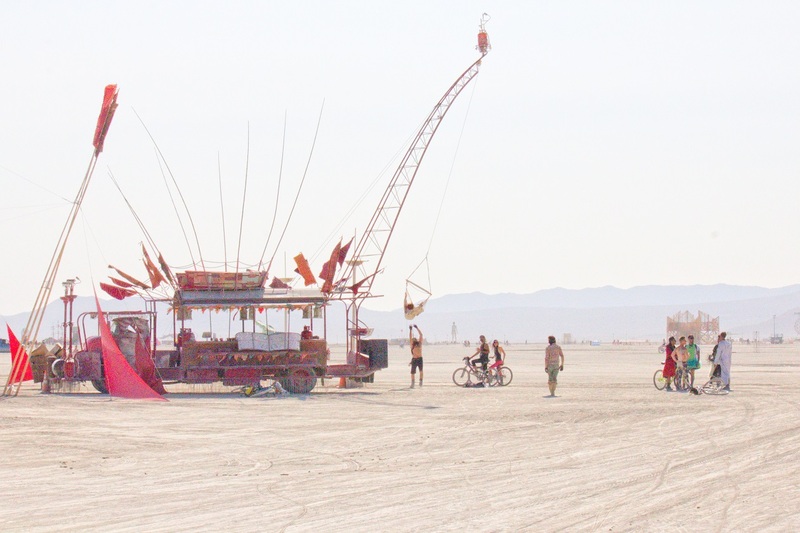 It’s made up of metal pipes that connect to create the skeleton of the dome. For this hut, an old military parachute was pulled down over the skeleton. 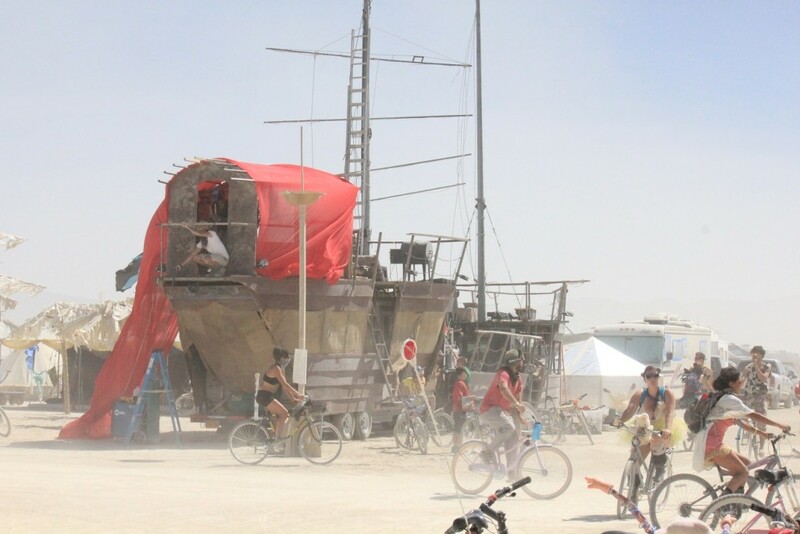 It is much hotter in there than the monkey hut, with less places for air to get in, but will prove to be a safer refuge later on in the week, when the winds whip up the sand into white-out conditions. 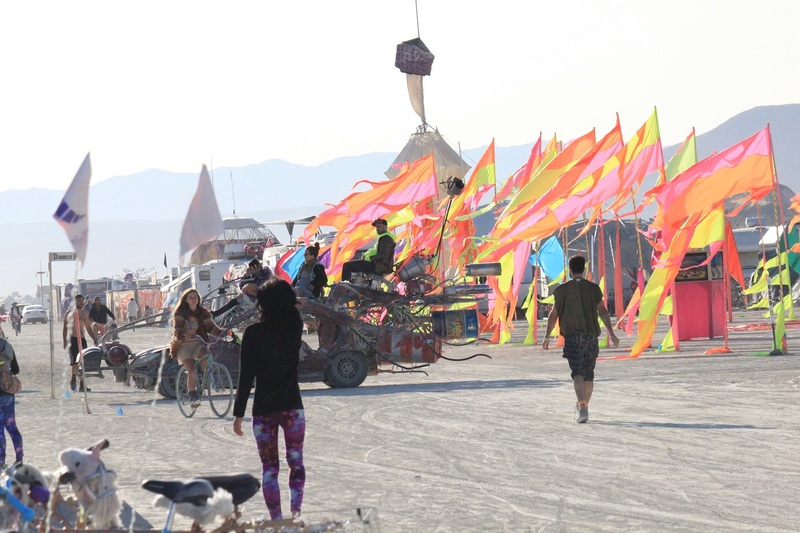 When I was trying to figure out what we’d need to do to prepare for Burning Man, my searches brought up some artcles and videos from Gone with the Wynns, that were a great jumping off point. 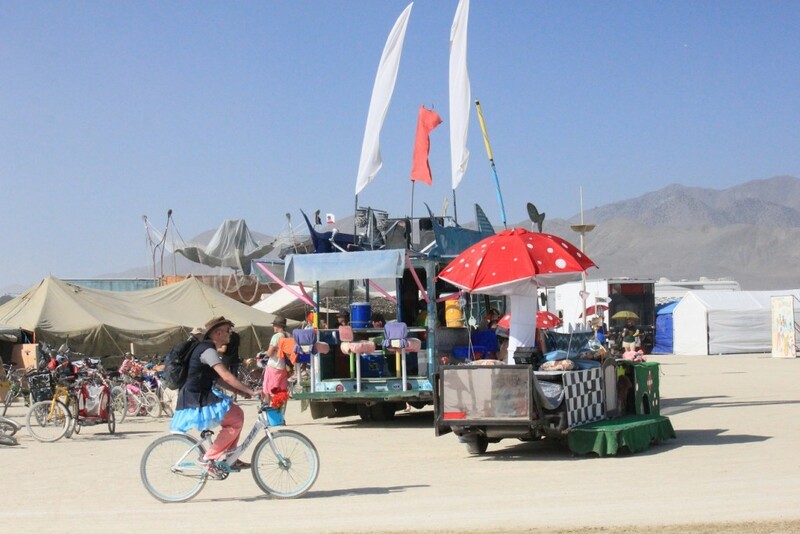 Stuff to know BEFORE you take your RV to Burning Man! 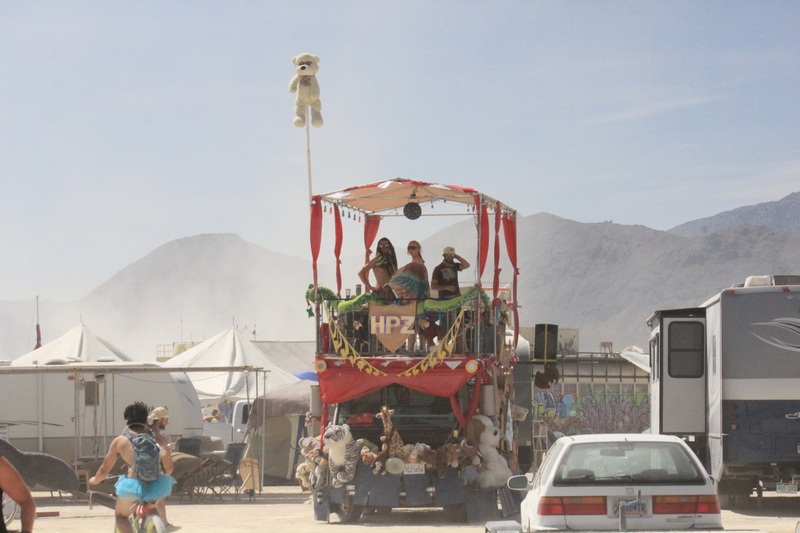 We do a lot of boondocking and some of it is in the desert, but not under the tougher constraints we’d be under in Black Rock City, with the playa sand, high winds, and high heat. 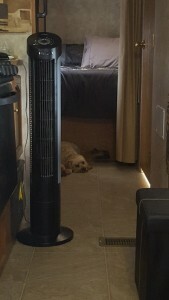 We have our power needs taken care of with our solar panels and a Honda generator for backup, but we can’t run our a/c on either of these. We knew we’d need to keep some windows open for air, so we took blue painters tape, and air filters to tape over the windows we wanted to keep open. We took a roll of silver Reflectix insulation that we taped over the windows on the outside. This stuff is good for keeping heat out when it’s hot and keeping it in when it’s cold. The moment we put it up, we felt a reduction in the temperature. Harold made a Swamp Cooler following the instructions of a few different sites, and it helped so much. It took a bit of experimentation to figure out how many holes we needed in the rubber tubing, but once we had the water running well, it cooled the place down immensely. We took a tall thin fan I bought at Costco that helped to move the air around more and get the cooling from the swamp cooler moving further into the trailer. Homemade Evap. 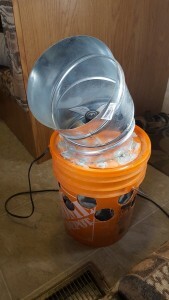 Air Cooler – The “5 Gallon Bucket” Swamp Cooler! DIY – can be solar powered! For the night time, I circled a bunch more events, and wrote them down. There is just so much to do, and it’s very tiring on the Playa, with the distances back and forth, the sand whipping in your face, and the hot sun. As a point of interest, there are 25 happy hours today, and they all have something just a little bit different. We make it for Sake and then later to Mardi Gras. 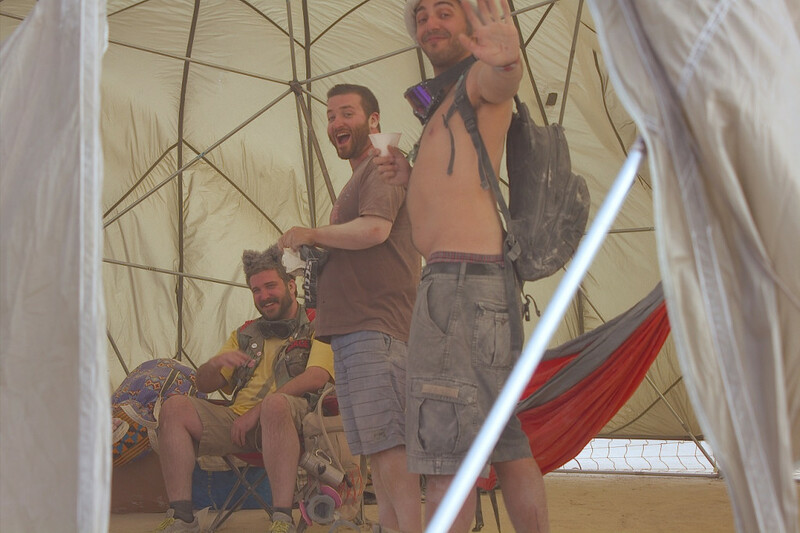 4:00-5:00 Black Rock Playa Dust: What’s in it? 9:00-4:00 1001 Nights at Brulee – Open champagne bar, gogo dancers, belly dancers, djs, drums encouraged. Thanks for taking the time and being so thorough in your descriptions. 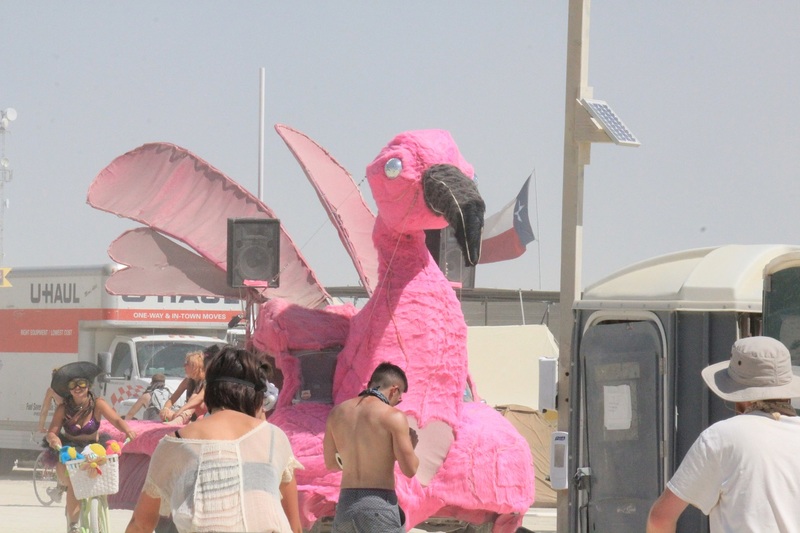 burning Man is a dream of mine and it was great fun to live it through your eyes! It turned out to be so much more than I’d hoped it would be. Next year will be even better! Maybe I’ll see you there! The Blunderwood Portable was my creation. Would you be willing to share your fantastic photo with us? 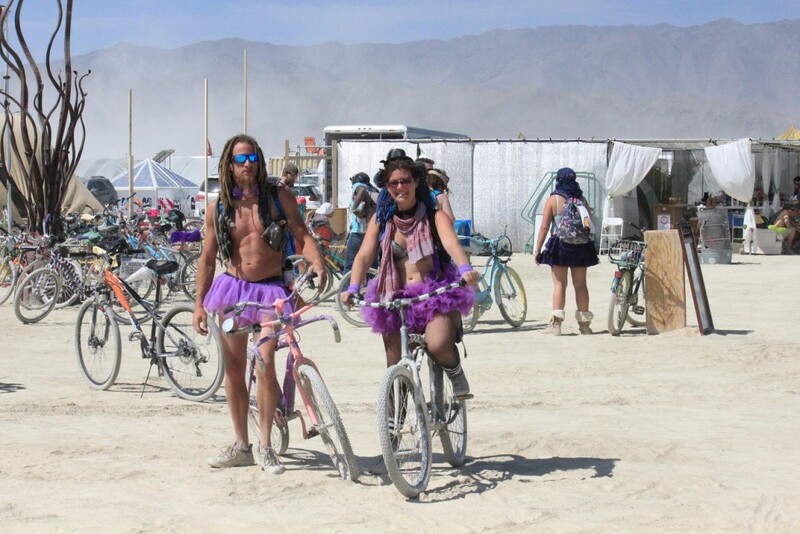 We need a high res photo to send to the Burning Man org to satisfy our grant requirements, and yours is perfect. Feel free to email me for more info. Absolutely! We actually have two images. I’ll send both in high res to your email.